A Santa Fe, New Mexico elementary school teacher is on administrative leave thanks to surveillance video that shows her dragging a 6-year-old student on his back down the hallway inside Gonzales Community School. 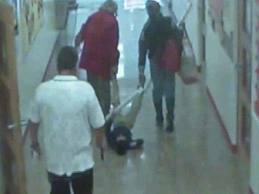 In the video the special education teacher, who is not being identified, grabs the boy, who is blind, by his ankles and begins dragging him down the hallway when another teacher joins in and takes him by the other leg. Meanwhile, a third person watches. Helpless, the boy does not struggle or fight back. The first teacher who laid her hands on the student told police the boy did not want to go to another classroom, and this was her way of getting him there. “We don’t believe the teacher was intentionally trying to hurt the child, but our problem is the blatant neglect for his safety,” Sgt. Andrea Dobyns, of the Santa Fe Police Department, said. The student complained his head hurt after being dragged, police said. Officers are still investigating and will speak with the boy’s parents to see if there is any history of this sort of discipline with this particular teacher.